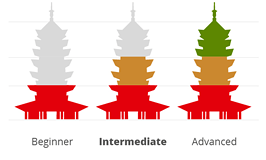 Welcome to the Intermediate Level online chinese level test. It has been carefully designed to help you decide which course is best for you. Just click ‘Start test’ below to answer the 30 short questions and receive your score and estimated level. Nice work! Your level is approximately Upper Intermediate – you may also want to try taking the Advanced test. Please make sure to let us know your result when you register for one our courses. Your level is approximately Middle Intermediate. Your level is approximately Lower Intermediate – you may also want to try taking the Beginner test. How do you write “RMB 150000” in Chinese? “diànnǎo” “电 脑” in English is _____ . We’re ready and waiting to help you in any way we can.